Product #21033 | SKU 016918 | 0.0 (no ratings yet) Thanks for your rating! The Rycote ConnBox microphone cable connector boxes are designed to mount on the Rycote Suspension system. The ConnBox serves as a solution for 2 major problems associated with microphone shock isolation. 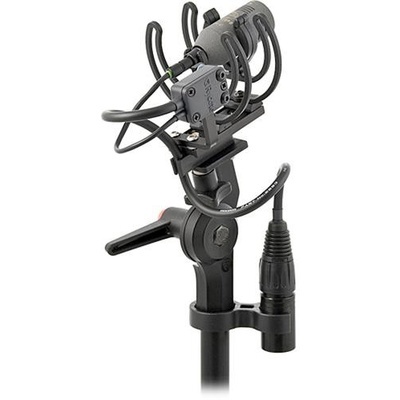 Rigid microphone cables often deny true microphone isolation, weighing the microphone down and causing noise from movement and vibration to reach the microphone. Noise and rattling due to bulky cable connections can cause problems as well. The ConnBox simply connects between the microphone and input device. Being that the ConnBox mounts to the Suspension system, the microphone cable is given the necessary slack needed to achieve true noise free isolation. This ConnBox features a hardwired output cable (XLR 3-pin or 5-pin connection depending on model) and a Schoeps CCM-L series input connector. The microphone cable is always included. A hardwired 3-pin XLR output cable connects to stereo 3-pin XLR microphone inputs. The ConnBox will pass phantom power to condenser microphones whenever necessary. This ConnBox mounts directly onto the Rycote Lyre Suspension Mount, relieving cable tension that can cause noise or damage.